Red Bull Racing ace Daniel Ricciardo says winning in Malaysia goes some way to making up for the win he was cruelly denied in Monaco earlier this season. Looking set to take a brilliant win in the Principality earlier this season, Ricciardo was denied a win when his pit-crew weren't ready with a new set of tyres, handing the victory to Lewis Hamilton. But when Hamilton's engine blew 12 laps from the end at the Sepang Circuit on Sunday, Ricciardo was perfectly placed to claim his first win since the Belgian Grand Prix in 2014. "After Monaco I had a lot of mixed emotions and it was a hard one to take but I felt as a team we came through that stronger and better," he said afterwards. "I’m feeling a bit emotional and overwhelmed! It’s been a long time between drinks! A couple of weeks ago I said we’d win a race this year but to be honest I didn’t expect a win to come at this circuit. "This year has been an awesome year of progression for the team. We started the year a step higher from last year and kept going and getting better, and it really is amazing to win at this circuit." 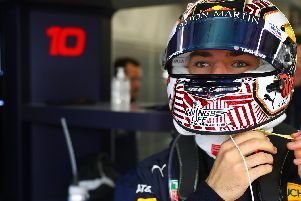 Ricciardo led home team-mate Max Verstappen, who celebrated his 19th birthday on Friday, but only after a brilliant battle which saw the pair go wheel-to-wheel before the Dutchman yielded to the eventual race winner. Ricciardo added: "We had a good battle with Max, he is a hard racer and we have that in common. We fought hard and aggressive but I think we showed we can push to the limit but still keep it on the track. We had a fair and clean fight and I think we both enjoyed it. "When the Virtual Safety Car came out and we both came into the pits for new tyres, that made me a little more comfortable for the last stint." Verstappen too enjoyed the battle with his team-mate, adding the Red Bull team on the pitwall allowed the duo to battle for the victory. “Having both drivers on the top two steps of the podium is a fantastic result for the team," he said. "The battle with Daniel during the race was great and really good fun. We have a lot of respect for each other so you can see we gave plenty of space but were still able to push hard. "I got close to being in the DRS activation zone but my rubber was slightly older and overheating so I just couldn’t get within range and attack. The team told us we were free to race as long as we kept it clean, which we did. It is really nice to hear that from the radio.